In previous articles we saw how to perform a mixed signal domain analogue, digital with a verilog spice simulation, cross-platform schematics entry, and blender for the visualization and animation of the mechatronics movements. In this article, we move further and learn on a very basic circuit of a MCU controlled current (force) control loop of a DC motor, about how to make a spice simulation even more comprehensive by embedding an actual C/C++ code in a unique way that requires no-modifications from the original code that runs on MCU or DSP platforms. 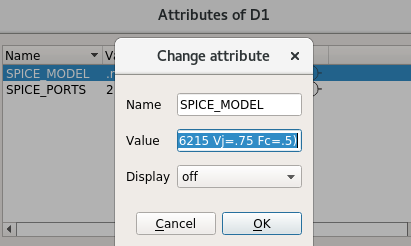 We will see how the NgSpice version of Spice Simulator becomes an indispensable development framework for the algorithm & embedded firmware developers, the system simulation, and the unit testing of real circuits. Consider a firmware development for Power Control Algorithms like Power Conversion (DC/DC, PFC, LLC), PMSM Three Phase Sensor-Less Motor Control, or Control Algorithms for Automotive applications, Fuzzy Logic Controllers, or even High-end Data-Acquisition. All of them combine knowledge from analogue, digital, signal processing, and embedded firmware development. A firmware developer may not necessarily be the same person who designed the analogue or power part of the project. Burning a MOSFET is not just about this, but it means time needed for repairs and associated damage costs. Having a system simulation environment for firmware development therefore represents a clear benefit. If such a framework does not require actual changes in the code, which can be run as unit tests and with a full debug possibility, then this clearly shortens the time of the development, broadening the test coverage to test cases that are hard to test even in practice, and the tests can be integrated in a Continuous Integration System such as is Jenkins. The simulation flow shown in this article uses Eagle for schematics drawings with the Isotel conversion to the ngspice netlist. However, the use of ngspice with the presented firmware development is not limited to it and may run completely independently and on all operating systems, including Windows. To keep the article short, very basic and limited models are used, simplification is applied whenever possible; however, overall, the project structure reflects a real project. Isotel NgSpice Fork in addition to the latest ngspice master branch provides Isotel d_process the xspice code-model for a simple integration of the external independent digital synchronous processes into a transient simulation. 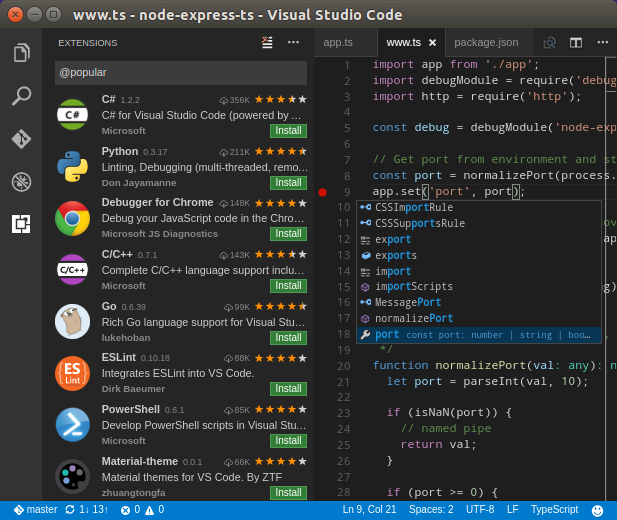 Visual Studio Code is a lightweight, but powerful source code editor that runs on your desktop and is available for Linux, macOS and Windows. First, designing a very basic schematics around a PSoC5 ARM based micro-controller with a high-side current sense and a single quadrant power source. In the next step, we model the inside of the micro-controller with analogue circuitry directly in the spice, PWM in Verilog with a digital interface to the ARM processor. Then, we design a very basic control algorithm in C that regulates the motor current and consequently its force. As the last step, we set a test bench, compile it, and run it within the simulation or as an external process with full debugging capabilities. Let’s design a very basic schematics that drives a 5 V DC motor out of a USB port in Eagle CAD (a different EDA tool could be used if it can generate an appropriate ngspice compatible netlist). and a floating rail-to-rail current sense to be sensed directly by a 12-bit SAR differential input. SPICE_PORTS to select pins of PSoC5 of our interest in the simulation and ignore the rest. SPICE_PORT device next to the USB Vcc and GND power, and provide motor connections, to the same points as an actual motor would go. More about the test bench later on; now, let’s go inside the PsoC5 and prepare for firmware development. PSoC5 is an extremely flexible micro-controller that features re-programmable digital and analogue blocks in addition to Cortex-M3 ARM. it’s so flexible its pin-out allow almost any function to be wired to almost any pin. It greatly simplifies PCB routing with some exceptions, of course, mainly on the analogue part. In this design the current sense resistor is big (1 R) and voltages across it are sufficiently big to be sensed directly. However, it’s worth mentioning that PSoC5 features rail-to-rail OPAMPs, which can form either two-opamp or three-opamp topology of the instrumentation amplifier and drive A/D input. The 12-bit SAR directly (diferentially) measures voltage on the current sense amplifier, at a sample rate 1/32 of PWM frequency. 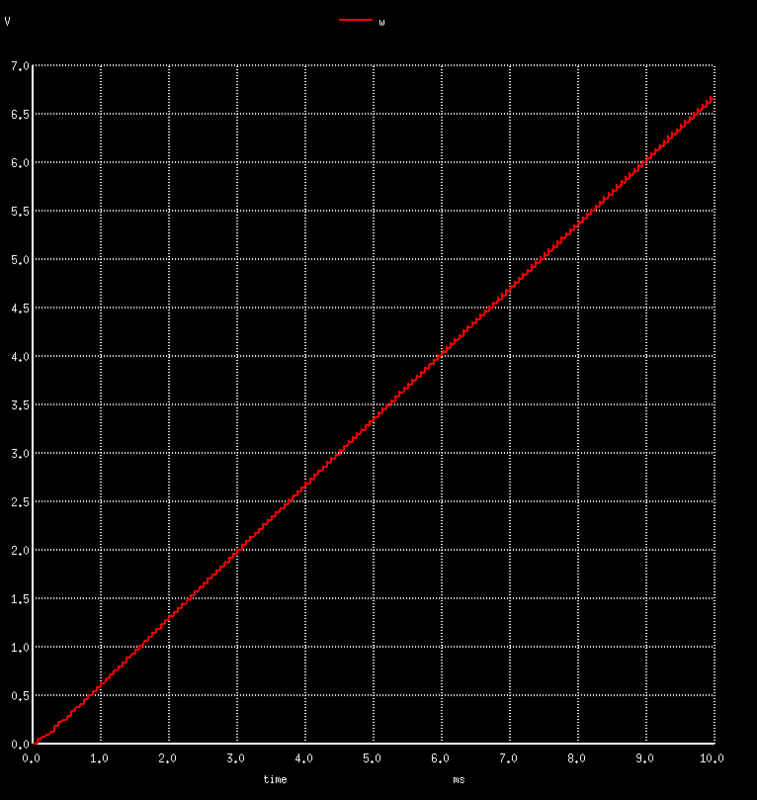 The 8-bit PWM generator is running with an output frequency of 16 kHz, clocked at 4.096 MHz. For the purpose of this simulation, we have built an ideal 12-bit SAR with synchronized (flip-flop) outputs, which produces one conversion per one AD clock. The A/D conversion rate is set to 512 kSa/s to do 32 conversions per one PWM cycle. The samples are summed and divided by 32 (shifted) to provide more stable readings. 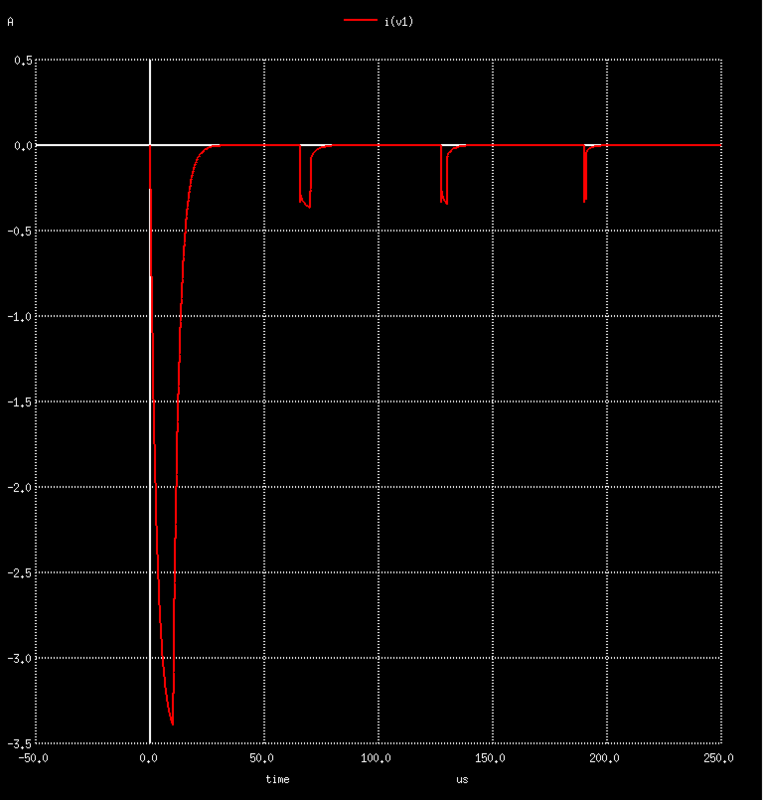 A more realistic A/D should include at least an input impedance model, gain and offset errors, and noise. To properly average the current within each PWM cycle, an 8-bit PWM generator’s clock must be multiple of 32 x 512 kSa/s, so 4.096 MHz, yields output frequency of 16 kHz. Let’s write it in Verilog. For details on how to use Verilog with ngspice, please read the Demo Project - Digital Sine Generator with PRS and Low-Pass Filter. It’s worth mentioning that PSoC5 can indeed have its digital re-programmable blocks programmed in Verilog language; besides a general purpose logic, it also contains more complex Data-Paths, which are like very simple ALU slices with 8 instructions. They provide a very efficient implementation of counters, PWM, adders, shifters, and other logic. a mandatory digital clock input. Upon every rising edge of the clock, all the inputs are sampled and transferred to an external process, whose process must in return provide new output states. Now, we are going to build a chip by including the A/D, PWM, clocks, and instantiating the Isotel d_process code-model in lines 33..35 to establish an interface with our code written in C. At the same time, we are showing how to pass the optional parameters, Kp=10 and Ki=2 , to the external process. * current on lower valued resistors. 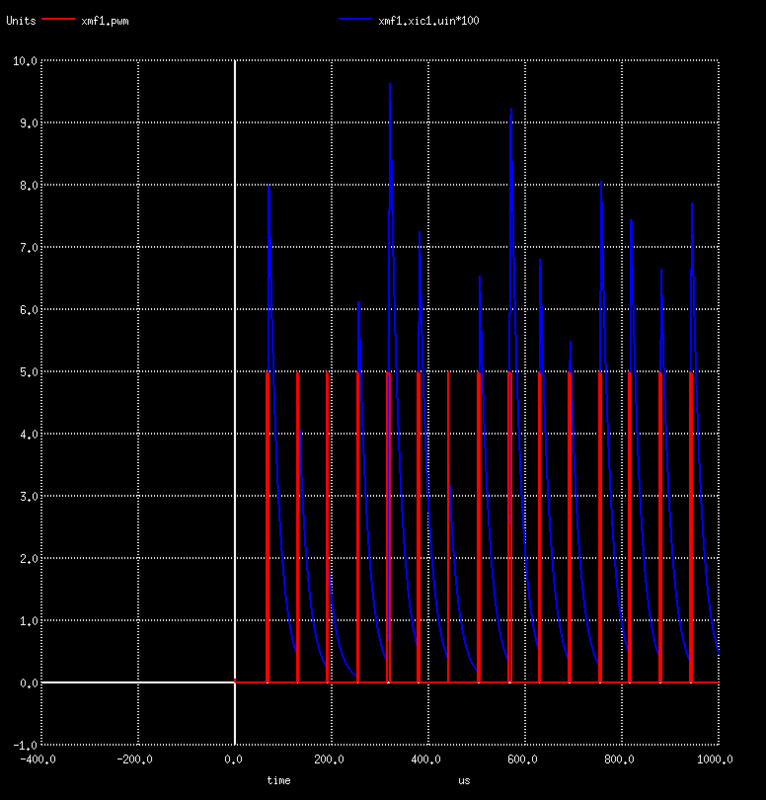 A reset pulse of length until the first rising edge of the clock is needed to reset the Verilog PWM module. The same reset pulse is also wired to the d_process synchronous reset input and so forwarded to the external process. Now let’s shift focus to ARM and coding in C. Especially when working on real projects, keep in mind the complexity of algorithms and the CPU power available. The good thing within the ngspice simulation environment is that the complexity and the speed of execution do not really matter, as the simulation of the electrical circuits will still be the bottleneck most of the times. Do use the same data types as on the target CPU. To simplify simulation, we isolate the control algorithm in a separate file without a specific Cypress PSoC5 dependencies, we choose: motorforce_controller.c This same file is then sourced by the Creator and our ngspice unit test (ngut). The motor current rises and falls through each PWM cycle. For regulation purposes, we are interested in the average of entire PWM cycle. Being aware that no aliases may occur at this spectrum, we may simply integrate 32 samples and cut the lower noisy bits. So our process would virtually see incoming events as A/D Interrupt Service Routine calls on PSoC5. * executes simple PI regulator and outputs an 8-bit PWM. The first thing one may notice is that we may use fprintf(stderr, …) to report intermediate progress. Some of the parameters could be global parameters, such as Ki and Kp , which are here intentionally exposed to have the option to change them directly from the ngspice code, as seen above. * Note that args come as lowered case. * Connect to a ngspice d_process and wait for stimulus in a loop. * the d_process will wait until it receives a reply. During a direct invocation from ngspice, stdin and stdout are used for communication with the ngspice. In this mode, errors or other information during the execution may only be reported via stderr. To support debuggers, the code provides an option to use named pipes to be able to independently start the code from the ngspice simulation process. ISR’s running at a rate of 0.5 MHz may not necessarily be an easy job, even for an 80 MHz CPU. For that purpose, PSoC5 features a special 24-bit DSP block called DFB, which could easily handle all the above signal pre-processing and regulation loop. The programming is a bit weird in an MLIW assembler, but one can quickly get used to it. In real life, the electric circuit would be implemented on a PCB and then connected to a power supply and selected motor. Let’s do the same, virtually: first, we draw a schematics describing the test case(s) and instantiate the motor force module as a block, adding an actual motor and power supply. After all, it is good practice to have documented our test cases as well. We used a very simplified and inaccurate model of a DC motor with brushes, sufficient to demo the case. The output of the motor is speed w [rad/s] . An additional A1 integrator delivers the position of the rotor, the phi [m] , whose output could be further used to drive some mechanical movements, as we have seen in the article Mixed-domain Simulation and Visualization of a Two Wheel Robot with Blender Open-source Software. Everything runs inside ngspice, except our firmware in C, which may be compiled with our native compiler or ARM cross compiler tools. In the latter case, you would also need to setup qemu to be able to run it. the two Eagle schematics are converted to ngspice netlists simply by running: run ngspice command. We may immediately notice our lively process in line 16 when it reports for the first time, then again in line 32, when it receives the reset signal, followed by A/D readings, PI loop parameters, and has calculated the new PWM output width. The goal of this project was to regulate the motor current and consequently its force to the desired value in AD LSBs of 100. When starting a real circuit, we might first want to check the system current consumption, which may observe directly from the test bench V1: plot i(v1) . Then, if the current is indeed constant, the motor acceleration should be constant as well, and the speed w must increase linearly. So, let’s plot W: plot w . Going inside the hierarchical design, we would like to see how PWM and the current sense (we magnify it by 100) are progressing: plot xmf1.pwm xmf1.xic1.uin*100 . Furthermore, may directly observe, export, manipulate, and merge in-out signals from our process with ngspice signals to get the most comprehensive view on our system. We may observe some overshooting and oscillations at the beginning, which stabilizes itself in the following cycles, with the error approaching closer to 0. In real-time systems, it’s really hard to debug a code with conventional debuggers and stepping through it. Why? You simply cannot stop and step through the reality. In this environment, everything is possible. 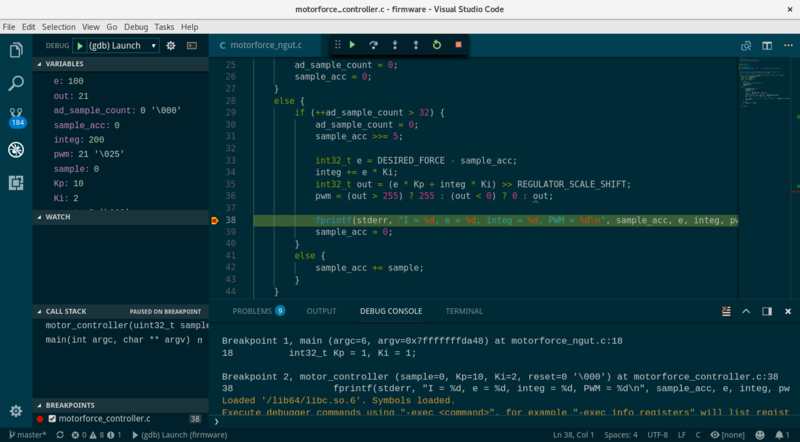 Here, we are referring to a very responsive and powerful editor, the Visual Studio Code. It also knows to highlight the spice files, while its main intention is to develop, run and debug the code. use named pipes; in this way, ngspice can attach to them at any time, and we are free to start the debugger at any time. Tell the ngspice d_process to use pipes and not to spawn a new process, by simply adding | operator at the end, so: .model firmware d_process (process_file=”firmware/motorforce_ngut|” process_params=[“Kp=10”, “Ki=2”]) An important note: in this mode, the process parameters are not passed to our process and must be entered manually when starting the debugger. Start ngspice and the debugger; as soon as both process are started, the simulation begins. To even come closer to the actual target platform, one may use arm cross compiling tools, qemu as an arm emulator with gdb to run and/or debug the code in an actual arm environment. Here, we represent a procedure tested on Fedora (we may add another examples at your request or upon feedback), as distributions have different package names. arm-none-eabi-gdb, as arm debugger. You may search for gdb-multiarch if you do not find this one. of GDB. Attempting to continue with the default arm settings. Any platform that has the ability to communicate with a host system can be integrated as a part of a ngspice simulation useful for the most demanding applications, such as the speed sensitive application where every cycle counts, safety sensitive as automotive, and aero-space and mission critical as military. The developer may therefore use their favorite target debugger, profiler, or they can even achieve an interaction with the real-world. on target side a ngspice unit test more or less of the same form as the unit test already presented above. As the target connects to the ngspice, there are no issues with synchronization. We have learned that ngspice with the Isotel d_process extension can be used as a framework for firmware development, algorithm development, unit testing in automated CI, and more. The d_process may spawn several processes, one for each firmware under testing. So when writing ngspice unit tests (ngut), keep the interface as simple as possible. To keep the article short, we simplified it and kept away from the actually very interesting topics of motor control algorithms, signal pre-conditioning, three phase driving, sensor-less algorithms, and so on. Precision and a fast servo motor controller are seeking for wide-bandwidth and low noise current sensing controller. It is worth mentioning that we have developed an innovative current sensing theory and products the DC-CT with bandwidths over MHz and a noise level of 1 mArms in 50-100 A range. All the project source files can be downloaded from github. Sign-up to our newsletter to receive more of our tech notes.